This past year could be called a test case for climate change. Scary as that sounds, 2014 has seen a broad spectrum of quirky events, ranging from drought and flooding to the loss of sea ice and glacier mass. There’s been some oddly good news as well: Some species continue to find their own way to adapt to climatic changes, opting for new environmental zones or alternative food sources. What will be our new way of adapting? Will we lead the pack, or follow suit? In Florida, one small city made headlines this year when it threw down the gauntlet and announced it was seceding from the state. That might not have been what Gov. Rick Scott expected when he announced his bid for re-election as one of the country’s biggest hold-outs against climate change, but it definitely garnered attention. Years of increasing flooding due to rising tides and Florida’s unique porous topography were the tipping point for the embattled city. The recent news that South Florida would probably be under water in a couple of centuries probably didn’t help. But with a freshly signed resolution to secede now making its way through South Florida’s 24 county governments, the city of South Miami may just get its wish for redress over the definitions of climate change in sunny South Florida. In 2013 we reported on a tiny town called Kivalina, Alaska, which sits above the arctic circle and has not only lost land mass to climate change, but also much of its traditional way of life. Unusually warm temps and loss of sea ice has placed the town of 370 inhabitants at risk, as the tiny land spit is buffeted by winds and storm surge. Local sources estimate that the town has lost a third of its land mass in recent decades, forcing residents to admit that relocation may be necessary in order to save their traditional way of life. The General Accounting Office estimates that relocation could cost as much as $400 million, however, given the shrinking coastline in other areas of the region as well. In 2008 Kivalina sued ExxonMobil and 23 other oil, power and coal companies for global warming, which the city said was brought on by carbon emissions. The residents didn’t win; the court punted the issue, saying that global warming was a political matter better regulated by Congress. That, of course, has yet to happen. It’s been a wild ride in California this year. Just about every region of the state has faced environmental changes, from bankrupting droughts to inundating floods. Lack of rain forced farmers to fallow their land and forced ranchers into bankruptcy. It also caused considerable problems for organic dairy farmers. Federal funds amounting to $100 million were called in to help ranchers, while Gov. Jerry Brown allocated $687.4 million for drought relief. The funds came from the state’s Greenhouse Reduction Fund and voter-approved bonds. Native American tribal communities also received assistance from the Environmental Protection Agency to combat climate change. Approximately $43 million was allocated to Southwest tribes to bolster water resources and infrastructure in remote, parched areas of the state. The arrival of winter storms in December is not expected to alleviate stress from drought, which is heading into its fourth year. 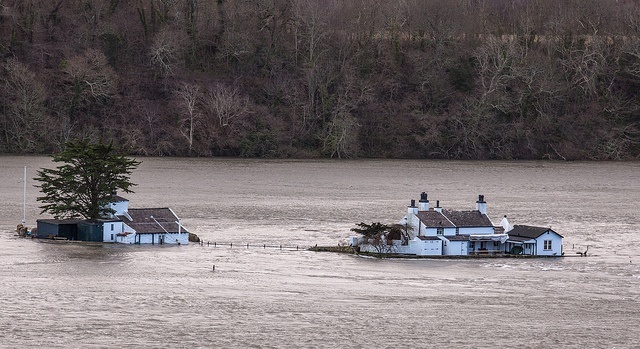 With record storms and flooding besieging the U.K.’s coastlines in past years, the government’s Environment Department has estimated that as many as 7,000 residences may be reclaimed by the sea in the next century. At greatest risk, of course, are homes and businesses that are vulnerable to storm surge, but last year’s widespread flooding in cities has heightened awareness that Mother Nature’s reach isn’t limited to coastlines. The tourist haven of Cornwall, England is expected to lose the most homes to the sea in the next 50 years. More than 750 homes in England will face risk in the next 20 years. We can’t close a New Year’s post on a dismal note, so we have this upbeat news to share: Earlier this year scientists found that some species are coming up with their own innovative answers to climate change. The polar bear and a wide selection of butterfly subspecies have developed intuitive ways to deal with changing temperatures and seasonal needs. For the polar bear, retreating to land more frequently and seeking out new food sources has allowed some animals to adapt to disappearing sea ice. The checkerspot, quino and comma butterflies have made their own migratory changes, opting for cooler climates. Trees, too, have found ways to adapt in Costa Rica’s drought-hit rain forests. Tropical zones in some areas are moving “up,” seeking more amenable environments for survival during what may likely be, another year of climate evolution.